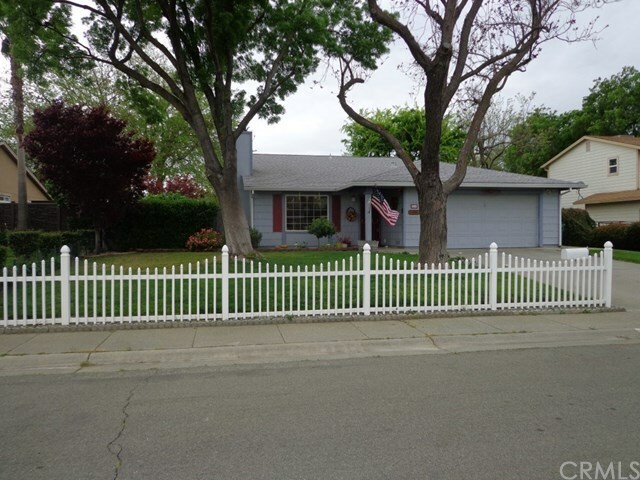 Your new home, complete with the white picket fence!! This well cared for home has a large living room with pellet stove insert and sliding door to outside. It is very open to the kitchen and dining area with wood laminate floors pulling it all together. Kitchen is bright and cheery, and has a new Bosch dishwasher, as well as a new sink and faucet. The eating area by the kitchen is expanded by a sliding door to a really nice screened patio area. Roof and HVAC were replaced about 10 years ago, the roof is a 40 year comp. House was recently weatherized, with new weatherstripping at doors and the dual pane windows with steel exterior awnings help to keep the energy bill low! Garage is nicely finished, and laundry facilities are located there, along with the new water heater. Yard is landscaped and has underground sprinklers. This home is NOT in a flood zone requiring flood insurance!! !